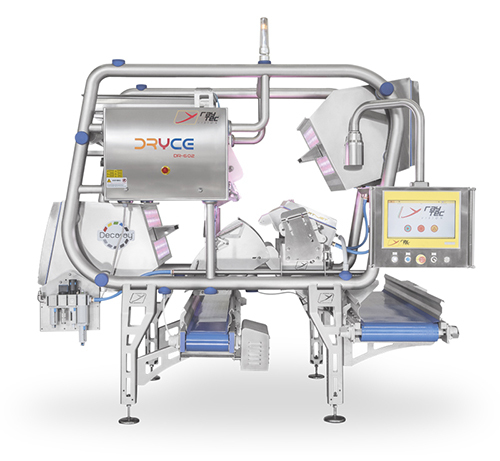 Dryce is an optical sorting machine with high resolution cameras that examine the product using the "free fall double side view" system which analyses 100% of the surface of each product. The system is specially designed to sort Dried and Frozen food products. Dryce can dispose of colour defects, rotten produce and foreign bodies also if they are of the same colour as the good product. A vibratory shaker built in the machine conveys the product to a vertical chute ensuring a consistent trajectory. Both models can be equipped with 3Way ejection system. They can have two reject systems on board to differentiate unusable produce from second quality. NIR technology can detect the presence of rotten and foreign bodies. The Chlorophyll analysis allows very accurate detection of foreign bodies in products with high chlorophyll content (peas, green beans). Translucency analysis enables detection of stones in the dehydrated fruit and contaminants with a different density from the good product. The Shape function calculates nine mathematical parameters for each inspected object. Those parameters are representative of geometric characteristics of the object such as eccentricity, compactness or the presence of protuberance. The Blob function rejects only the groups of pixels (blobs) whose sum of weights is higher than a value defined in the sorting recipe. The Stem function allows the detection and rejection of stalks, stems, wires or any other thin object in the product stream. The Glass function enables to detect and reject transparent pieces of glass and plastic. The Big Stop allows to control the presence of dangerous foreign bodies. This function enables a series of programmable choices: object calculation allocated in three different classes of dangerousness, automatic image capture of dangerous contaminants, alarm generation (with option to stop the machine). An ethernet connection is available for remote control. The Raymote safe connection is available for internet access. The Raymote Firewall allows to connect automatically to Raytec's control systems, guaranteeing an efficient, continuous and safe assistance: Raymote has been designed to avoid external hacks. User-friendly software for easy use and programming.